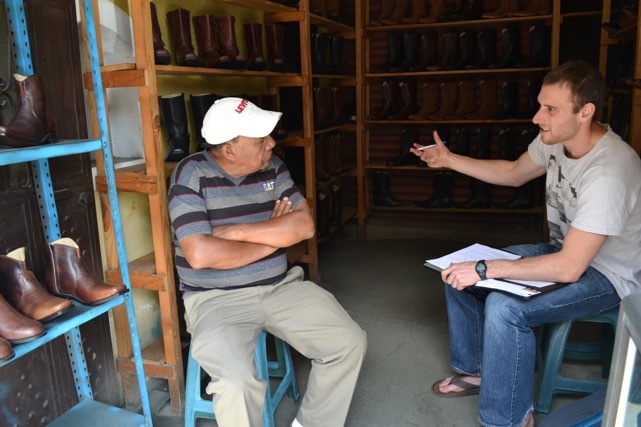 I’ve been here in Guatemala for just over two weeks now, working each day to develop the first Adelante Shoe Co. product line with a select group of craftsmen in Pastores. Each morning I catch a “chicken bus” into town — a tense 20 minutes of abrupt stops and high-speed swerves that leaves me dusty on Pastores’ main road. From there I make the rounds, touching in with each partner shoemaker on quality of materials, style specifications, and challenges they face. My three objectives for this trip are to complete all product line prototypes, film the entire shoemaking process for an Adelante launch video, and build relationships with the craftsmen. Currently, all three objectives are progressing fabulously. I enjoy myself most when deep in conversation with a small business owner or his employees. We discuss topics ranging from the upcoming US elections to the roots of poverty in Guatemala. One recent discussion with a short, tattooed craftsman named Nery stands out in my mind. Nery is a 35-year-old Guatemalan with a wife and two school-age children. His wife doesn’t work, so Nery is the lone breadwinner for the family. With his salary of Q100 per day, he struggles to keep food on the table and can only intermittently afford to send his children to school. Nery’s situation highlights the potential for Adelante to change lives here in Guatemala. Nery is neither mistreated nor exploited at work. The problem, rather, is that the Guatemalan market does not value his handmade, leather shoes nearly as much as other, higher end markets. By connecting Nery with the fashion shoe market in the United States, Adelante can effectively double Nery’s pay while still turning a profit. An increase in pay from Q100 to Q200 per day would move Nery and his family out of poverty and into the lower-middle class. With this money, Nery could send his children to school and live comfortably with his family. Such is the power of market access when coupled with responsible business practice.